Before we dive into the next cheesecake recipe I want to thank all my lovely blog readers out there who have written in to say how much they have been loving the cheesecake recipes! remaining crumb mixture onto the base and 5cm up sides of a 23cm sprinform tin. Set aside. sour cream and stir into cheese mixture. Pour into tin. Sprinkle the crumb mixture we put aside on top. Pre-heat the oven on high to 190 degrees and bake for 50-55mins or until nearly set. Cool on wire rack and then chill for four to five hours. melted. Add roughly chopped pecans. 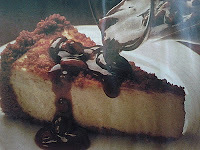 Serve warm over cheesecake.